Floating resorts or complete sea cities? This is what nowadays cruise ships are. Cruise vacation includes everything you need: entertainment, fun, worldwide travel. 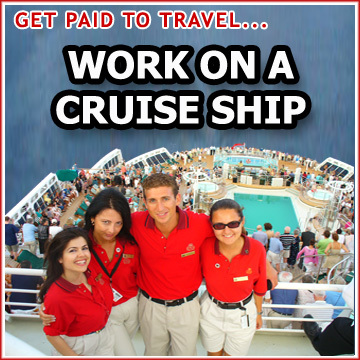 If you start working for a cruise ship company, you will get the best of cruise ship jobs- travel, romance, adventure and steady paycheck. More than three hundred types of cruise ship jobs exist and numerous opportunities at companies’ headquarters. Wouldn’t it be terrific to get paid and be able to travel to places around the world that you have always dreamed of! Which of the cruise ship jobs is the one for you? Cruise lines hire different people- students, retirees, career-changers and always seek for experienced people in tourism, hospitality, entertainment, teaching, bars and restaurants, sales and customer relations, marketing, health and beauty, fitness, medicine, administration, accounting banking, financial management… The most important thing to provide by the way, is fun, safe, memorable vacation! This is the reason why dependable people with positive attitudes are preferred by cruise ship lines. How to get hired on a cruise ship – find cruise ship jobs? Find information about the players on cruise market and cruise lines that are most likely to hire a person like you. First apply to the most successful and famous cruise lines and to such which are adding in fleet new ships. The “Big Three”- the main players today are: Carnival, Princess and Royal Caribbean– these cruise ship companies have the largest fleets in cruise industry and have to be at top of your list. Unique opportunities exist with smaller cruise lines to find and get the perfect job for yourself- Special Expeditions and Delta Queen Steamboat Co. are chances that worth trying. Who will get hired depends on the type of facilities offered by cruise lines. Cruise ship companies with heavenly spas and fitness centers usually hire more massage and aroma therapists, stylists, fitness instructors. Jobs concerning entertainment vary a lot- Seabourn and Crystal Cruises may hire pianists, lecturers, duos and classical quartets; NCL’s theme and sports cruises create openings for lecturers, celebrities, theme entertainers. Most likely to get the job on Royal Caribbean International, Princess, Celebrity, Carnival, Holland America Line, are comedians, Rock N Roll or Jazz bands, production dancers. The type of guest on each cruise line also determines the opportunities for cruise ship jobs- Carnival Cruise Linesand Disney Cruise Line hire the biggest year-round youth staff in industry. Start by choosing several jobs that interest you most and then compare the qualifications you have to the required responsibilities. You will soon learn what certifications and skills you need to get aboard. Let the personnel director know how you are qualified for the cruise ship job. Find out the strong sides you can offer and target your CV (resume) and cover letter towards a single specific job. Show how your work experience, education and skills relate to the needs of the cruise ship company. Just listing your accomplishments is not enough- show your future contributions to passengers’ cruise experience. The CV (resume) has to give information about previous work experience, responsibilities, promotions salary history. Also include educational achievements, certifications and degrees, awards, membership in organizations. Apply often and send resume updates and follow up letters. How is the pay? Companies in cruise ship business pay the same as for good jobs shore, but you will be able to save a lot of money- expenses are left behind and your meals and room are included. The decision to bank your salary or blow it away in ports of call, depends on you!